The ales of alive traditions mentioned earlier are either feast or medium strenght ales. The traditions of small beers seem to be largely extinct, but there might be some well-preserved remnants in the Baltic states. Several modernized versions of traditional small beers are still brewed and sold in northern Europe, like kalja (Finland), svagdricka (Scandinavia), gira (Lithuania) and kvass (Russia). Read Small Beer Called Kalja for details on historic low alcohol farmhouse beers. Malted and unmalted grains, juniper branches, hops and yeast are the basic ingredients of these ales. Malted barley is the most common base, but also rye, oats and wheat are used in both malted and unmalted forms. Unfortunately traditional home malting has mostly disappeared, and now most brewers use commercial malts. 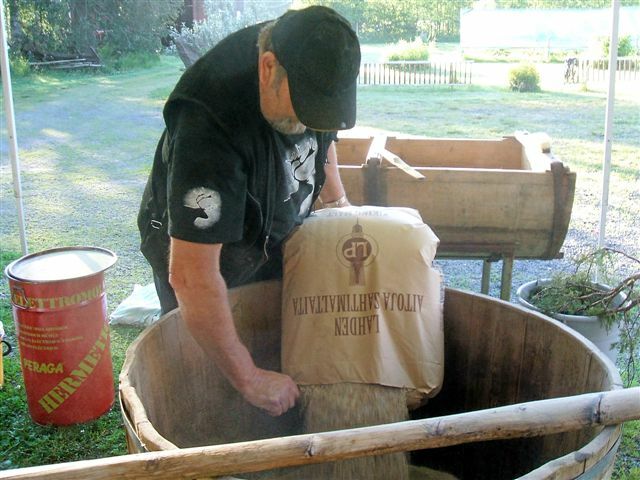 In Norway and Lithuania some brewers still malt in the traditional way. In Finland some farmers have revived home malting, but to my knowledge nobody malts in the most traditional way in smoke saunas or drying barns. 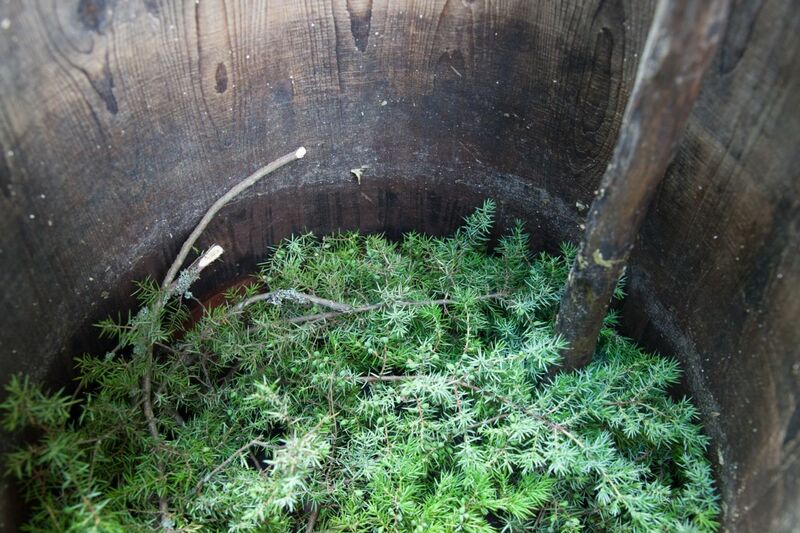 Juniper is the most important brewing herb in the Nordic and Baltic farmhouse ales. Traditionally the juniper flavor comes from the branches laid on the bottom of the lauter tun filter (see image below) or from juniper infusion (branches infused in hot water). The taste of branches is needle-like and woody, somewhat different than flavor of berries. Hops are used fairly often, but usually in minor quantities. Sahti is often unhopped. House yeasts are rare these days, but some brewers in Norway and Lithuania are still fermenting with their traditional heirloom yeasts. In the past some houses made both bread and beer with the same yeast, and hence it is natural that many traditional brewers use now baker’s yeast, though commercial. Some use also brewer’s yeast, but in sahti only traditional house yeast or commercial baker’s yeast are allowed. This rule is written in the EU Traditional Specialities Guaranteed appellation of sahti. Other than aforementioned ingredients have also been used, but during the last hundred years it has been surprisingly rare. The most notable exception is the use of honey (or nowadays sugar) in gotlandsdricke. See Lars Garshol’s take on Nordic brewing herbs. For those unfamiliar with brewing, I review shortly the essential brewing terms. With very few exceptions, a modern brewery is operated as follows: first malts are mixed to hot water. This procedure is called mashing and the mixture mash. Then, the sweet liquid of malt sugars called wort is drained from the mash in the process of lautering. Finally the wort is boiled with hops, cooled, fermented and packaged. Accordingly, a modern brewery has always a big kettle for boiling the wort with hops. In the old times farmhouse brewers could not afford big kettles, and their methods evolved around wooden brewing gear. The most traditional farmhouse setup involves two large wooden vessels: A tub for mashing, and another tub or a trough-like vessel, known as kuurna in Finland, for lautering. Wooden vessels cannot be heated externally, and an old trick is to drop hot stones into the concoction. However, with hot stones long boils would be awkward, and hence the ancient farmhouse brewers skipped the wort boiling step altogether. This lack of wort boil has a tremendous effect on the beer, and is one of the major traits of Nordic-Baltic farmhouse ales. A beer from a non-boiled wort has a short shelf life, but when fresh, has an exquisite taste of malt and cereals. Due to retained proteins, it also feels nutritious, smooth, and full bodied. An ale completely devoid of boiling steps is called raw ale. Today many farmhouse brewers use stainless steel equipment, but their brewing process is inherited from ancestors, as if the brewers still had only wooden tubs and a thermometer had not been invented. Some present-day brewers boil the mash instead, which is most likely a remnant from times when the mash was heated up to a boil with hot stones. There are also farmhouse brewers who boil their wort, but the boil time can vary wildly from one minute to five hours, again something completely different to modern commercial breweries. Typically these ales are fermented warm for a day or two and then transferred to a cool cellar. With house yeasts the traditional fermentation temperature is milk-warm (35–40°C). 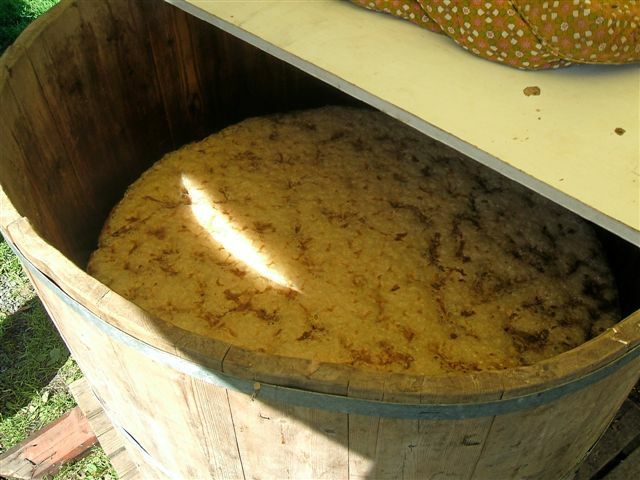 Often a considerable amount of residual sweetness remains and a slow secondary fermentation keeps yeast active, protecting from staling and souring. These ales are usually served within 1–3 weeks from the brew day. These ales have survived from the arrival of distilled alcohol, onset of cheap industrial beer, the temperance movement in the Nordics, and the soviet reign in the Baltics. Without rich and unique taste these traditions would surely be dead by now. The taste is so different from modern beers that the first-timers may have difficulties to judge if the pint is as it supposed to be. Here is a briefing what to expect. There are some regional preferences, sort of sub-styles, but distinction is not always very clear, as the variation from brewer to brewer is often enormous. For this reason these traditions are not exactly defined beer styles in the modern sense. Besides, even the same ale can taste different every time, particularly due to differences in age and storage. Although these ales may go sour when they age, sahti in particular, sourness is usually considered a flaw. The appearance is often turbid, but haziness is more related to high protein content, rather than yeastiness. Some yeast are may be suspended, but obvious sensation of yeastiness is a flaw. Due to proteins, the mouthfeel is typically smooth, and sometimes highly viscous and milkshake-like. In the Nordics these ales are typically served still or with slight carbonation, while in the Baltics farmhouse ales are more often served clearly carbonated. Color ranges from yellow to dark brown. 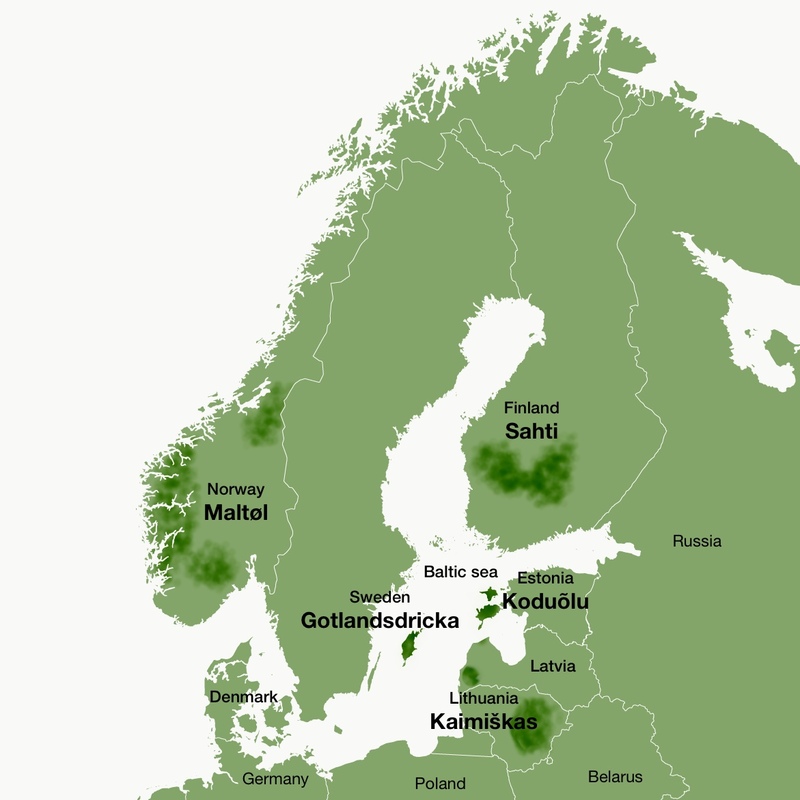 In the Baltics paler examples are more typical, but in many parts of the Nordics reddish brown color is sought-after. Most examples taste sweet with rich fresh maltiness and graininess. The paler ones are more honeyish and grassy, while the darker ales express dark bread and toffee. Many Lithuanian ales have an unique hay-like taste from local malts. Taste of juniper vary from none to pronounced, more inclined to needle-like taste of branches than berries. Usually these ales have expressive fruitiness and spiciness from the fermentation. Quite often sahti has a prominent banana aroma, somewhat similar to weizenbocks. However, some brewers prefer their sahti malt-forward with no signs of banana. Some Lithuanian examples may have notes of butter. The overall impression is extremely fresh, nourishing, smooth and drinkable. In the past these ales would have picked some smokiness from the malting process, but today smoke aroma is rare, except in parts of Norway and Gotland where brewers malt themselves. In 2014–2015 I wrote the book Sahti: Elävä muinaisolut (in Finnish) with Johannes Silvennoinen and Hannu Nikulainen, and bulk of my research was done during that time. 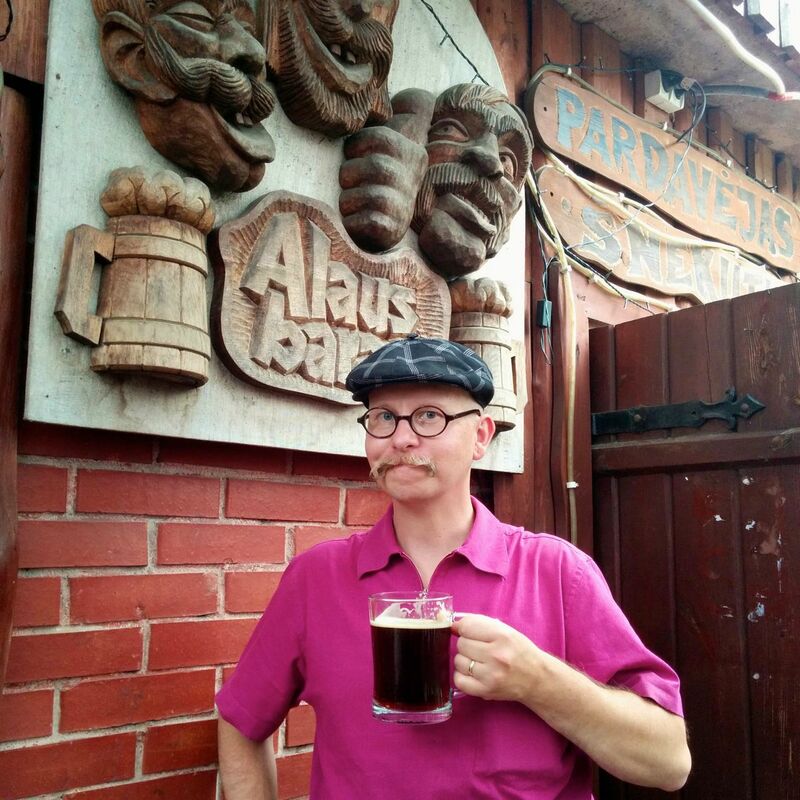 We travelled 8000 km in Finland and Estonian islands, interviewing about 50 sahti and koduõlu brewers, and tasting more than one hundred examples of these ales. I also interviewed experts and scientists on malting, yeast, archaeology, botany and baker’s yeast production. I have been homebrewing sahti since 2004, receiving numerous brewing tips from true farmhouse brewers. For the book I made several brewing tests on farmhouse ingredients, techniques and recipes. Great article, i would like to know some specification about the natural yeasts that they use, do you know some source? I’m a sardinian homebrewer and i’m fascinated about the nordic brewing traditions but i can’t find a lot about the yeasts typologies. Lars Garshol has has written quite a bit about Norwegian farmhouse yeasts called kveik in his blog. See for example his article Kveik: Norwegian farmhouse yeast. Traditional farmhouse yeasts are still used also in Lithuania, but there is little information about them. Perhaps at some point Lars writes about them too. This is the article that got me into binge-reading all your articles! Makes me want to go on a road trip through the Baltic and Scandinavian countries for a taste of their interesting beers. I’m in Canada and this Easter collected a bunch of juniper branches with berries and tomorrow am giving Sahti a try. I’ve brewed a fair bit at home but nothing quite like this. Thanks for the story! I’m glad you liked the stories. Let us know how the Canadian juniper branches taste like. It seems that junipers branches around the world taste very different. It was really nice! The sahti had a lovely golden colour, and the juniper flavour was much milder than i was expecting. It was lightly pine-ey with some subtle woody bitterness. Clove and banana wre the biggest notes. I used the yeast i use for my kvass. Thanks again for the intersting post. Thanks for reporting the juniper flavor. A very mild taste of juniper is typical for sahti.